We’d all love our bathrooms to stay spotless and not have to clean them ever so often, but the fact remains the same; bathrooms get dirty. Even worse, they get so soiled sometimes that even the homeowners are disgusted to use them! Regardless of where your bathroom rests on the dirt-o-meter, anything less than clean is not usable for guests, and is quite unhygienic for you and your family members, too. 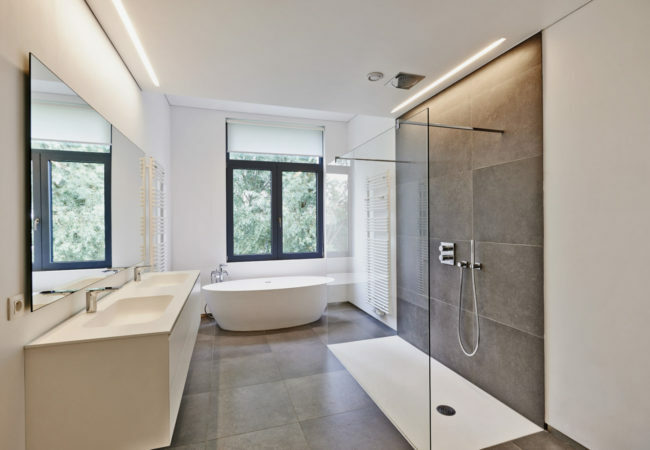 Like most homeowners, you’ve probably been cleaning your bathrooms as and when needed, using the same cleaning techniques and solutions that result in a clean, decent looking bathroom. But what if you had a couple of tricks up your sleeve to give your bathroom that extra sparkle and get your fixtures looking spotlessly new again? Sounds too good to be true? Well, it’s not! With these great bathroom cleaning tips, you’ll see it, to believe it! 1. Get Your Shine On! There are two general ways to clean bathroom floors; using a regular cleaning product, or a homemade solution. With a store-bought product, you simply sprinkle the floor with the cleaning solution and scrub the tiles using a bathroom brush. Similarly, you can make a pasty solution of 2 parts baking soda, 1 part borax and 1-2 parts water, and use a regular bathroom brush to clean. This homemade solution is great for removing grout and grime between tiles. While these methods are good enough to get your bathroom floors clean and grout-free, they won’t bring about any sheen or sparkling. But this will; use either lemon oil or furniture polish to buff your bathroom floors after you’ve cleaned and dried them. They make them bathroom tiles shine like you never thought they could! All you need to do is spray the floor and buff them with a soft, microfibre cloth. 2. A Stain-Free Toilet Bowl? Yes, Please! We’re not going to get into the dirty details with regard to stains in your toilet bowl; instead, we’re going to tell you how you can prevent staining for weeks on end using car wax. Brace yourself; this takes patience, hard work and a lot of tolerance to filth. Clean the toilet bowl like you typically would using a liquid bowl cleaner and toilet brush to remove the stains completely. Once this is done, close the main valve for the flush tank and hold down the lever to flush (drain) out all the water. Rinse the bowl by pouring a few mugs of water around and draining it out as well. Next, take an old towel and dry the interiors properly. Choose a polymer-based car wax for the job as this lasts longer than other toilet bowl formulas. Use a cotton cloth to apply the wax to the interiors of the bowl and leave for 20 minutes before you open the valve and refill the bowl’s water. It’s also a good idea to pour in half a cup of distilled white vinegar every month to prevent water rings in the bowl. 3. Shower Curtains That You Can Touch Again! Because of the excess humidity and dampness in bathrooms, it’s hard to avoid the build-up of mildew and grime on your shower curtains. To clean, take them down and make a solution of half cup vinegar and half cup borax, mixed in 2 cups of warm water. Pour this solution over the curtain and allow it to sit for 10 minutes before scrubbing it clean with a sponge. Now that your shower curtains are clean and free from bacteria, you’ll want to keep them that way for as long as possible. Try this; make a saltwater solution in your tub or a large bucket and leave your curtains to soak for about half an hour before you hang them up again. Depending on how big the curtain is or how many you soak at a time, you’ll need 2-4 cups of salt in just enough water to submerge the curtains. For chrome or nickel fixtures: wipe the faucets dry, take a clean, damp cloth and pour some vinegar onto it. Use this to wipe down your bathroom fixtures and then dry buff them with a microfibre cloth. For Copper or stainless steel fixtures: you can use a store-bought cleaning product specified for these metals, OR you could use club cola to buff them! The acid content in club soda renews tarnished bathroom fixtures, making them sparkle like they did the day they were installed. At Simply Maid, we like to take it one step further and get the most out of cleaning solutions. Whether it’s in our cleaning tips (or fingertips), we believe no job is complete unless it’s thorough and leaves you 100% satisfied. To understand what we mean, the proof is in our results; book a cleaning service with us for any type of household cleaning. Visit our homepage for more information.